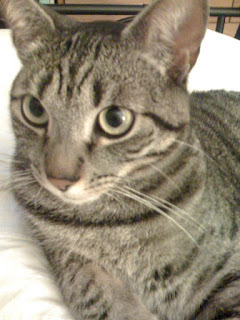 Unstoppable Spirit: Meet my adorable cat "Ranger"
Meet my adorable cat "Ranger"
I am not a pet lover not until we adopted a new member of our family, Ranger. He is the sweetest. Everyday when we come home, he is always there to greet us and get all cuddly and affectionate. He is also very funny. I love playing with him. He goes nuts with the laser pointer and goes hyper with the squeaky toy mouse. Whenever we are having a conversation he would make funny sounds like yapping as if he is part of the conversation. He would normally look outside the window and watch the birds. Whenever he spots one he would go, "ekekekekekek". 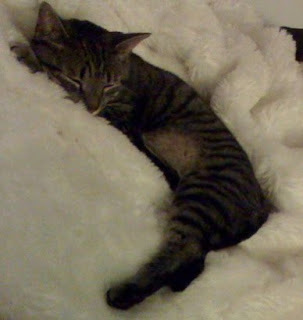 On a lazy mood, he would lay on my white fur throw blanket I got from Costco. Good thing this fur is machine washable. This furry throw is my favorite when I am lazing around on the couch watching TV or reading a book especially now that is getting cold. But Ranger would lay on it and no one can get him off it. He acts like this is his territory. He is so cute. At the end of a stressful and tiring day, my cat would lay next to me and helps me relax. I'm glad we adopted him. Ranger really is adorable! He is lucky to have found a home... and a family! 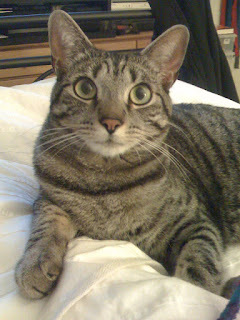 Ranger looks like my adopted cat "Prudence"! Adorable cat! He is luck to have you..
Ranger has made himself at home in your house. He feels safe and loved. My stepdaughter has three cats. My husband and I enjoy visiting our grand kitties. Nice cat. Do you know cats never relax in front of anyone unless they completely trust them? Awww what a sweetie! I love kitties. Thank you for following our blog!! I love tabbies. I lost my cat Hootie last year. I hope you have as many happy years with Ranger as I had with my cat.